Did you know you can now receive all of the benefits of a Georgia defensive driving course from the comfort of your own home? Our online course makes it simple, quick and easy! Our I Drive Safely partners have helped thousands and are readyt to help you, too. How Can Georgia Defensive Driving Help Me? Taking a Georgia Defensive Driving course offers many benefits. For starters, your driving skills will improve, making trips in the car safer for you, the folks in your car and the folks you’re sharing the road with, too. As if that wasn’t enough, taking this course can put money in your pocket. Many insurance providers offer premium discounts to their customers who complete traffic school. The benefit of taking this class online is that you don't have to travel to attend, and you can work on it on your own schedule. 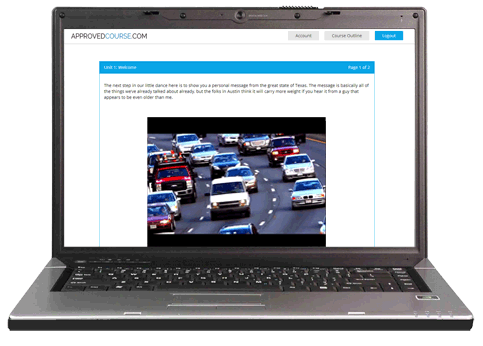 The course is 100% online and is completely self-paced. You could be on your way to saving money, right from the comfort of home. Check with your insurance provider as to whether they offer these discounts. If not, you may want to find another provider! This course features short chapters filled with engaging animations and graphics. Every unit ends with a multiple-choice quiz designed to help you learn and retain the material we covered. What’s more, you can’t beat the convenience. Taking the course online allows you to log in and out at any time, from any computer and at a pace that works with your schedule. Don’t rearrange your life to sit in a classroom for hours on end, arrange your lessons to fit your busy lifestyle. If you run into something during your course that makes you scratch your head, don’t worry. We offer live customer support 7 days a week, 24 hours a day. Can I Get a Traffic Ticket Dismissed in Georgia? Currently, there are no defensive driving courses approved by the state of Georgia for the purpose of ticket dismissal. However, the insurance savings you can earn by taking our course may be enough to offset the increase a traffic violation might cause to your premiums. Additionally, there is a chance that the judge in the jurisdiction where you received your ticket may grant you the opportunity to reduce points off of your driving record with a Georgia defensive driving course. Even though you will still have to pay for your ticket, the consequences of it might not be reflected on your driving record. Be sure to ask the court because if the judge says yes it will, in effect, represent double savings for you! No Hassle and Quick Delivery of Certificate! We do all we can to make sure you receive your certificate as soon as possible. As soon as you complete your course we will process it immediately and get it on its way to you. Finish it by 3 PM Central time, and we will get your certificate in the mail to you the same day for FREE. Need it sooner? We offer expediated delivery options for those in a time crunch. Saving money is always a great idea so why not get started today? So How Do I Save Money With Defensive Driving? How to Earn a Discount on Your Georgia Auto Insurance. Contact your insurance provider and ask about possible discount programs offered by your company. Your agent will be happy to let you know about any such programs, what your discounted rate will be, and when it will go into effect. Enroll in and complete your Georgia online defensive driving course. Submit your certificate of completion to your insurance company. Your certificate will be mailed to you so make sure you get it to your agent for processing. Georgia Defensive Driving the Quick and Easy Way! Start Enjoying the Insurance Premium Discounts You Deserve!